After beating the weather systems on Christmas Day I was beginning to feel blessed. And so in spite of unrelentingly bleak predictions from the Met Office we refused to take a raincheck . Even as we were putting our boots on I half expected the masses of misty grey to magically dissipate. Not so. Boxing Day was every bit as dire as the predictions promised it would be. We resolved not to be out for long. A quick rethink was had and the route was sensibly reversed. I decided it was better to get the most exposed and open section out of the way first. 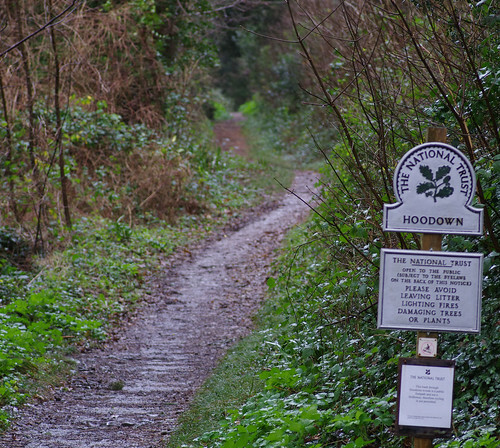 As luck would have it, the sheets of drizzle propelled us slightly faster along the path by the railway track. There weren't really any photo opportunities, either. Even Sherry (who can normally see a potentially interesting shot when I insist there's nothing worth capturing) had her finger away from the shutter most of the time. 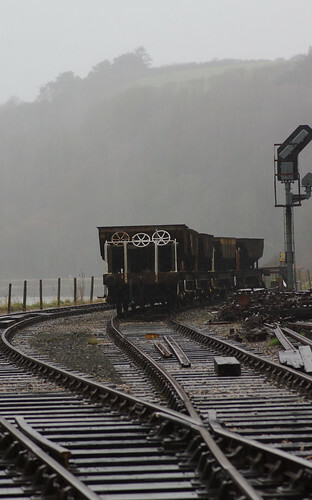 These goods wagons provided the only substantial pause as we headed adjacent to the line before crossing it and entering Hoodown Wood. Once inside Hoodown, there was a gorse bush with a single yellow flower that would not stay still for a second. Up the hill and not long after turning right at the top, we took an early lunch, squatting under a tall Douglas Fir tree that obligingly gave good cover from the intensifying rain. Feeling a bit warmer, we pressed on, unaware there would be anything of interest to slow our pace. This species was plentiful on both sides of the path. They were supine among the undergrowth, sprawling like white worms. And then there were the specimens like the ones above: erect and twisted they put me in mind of some strange Henry Moore sculptures I used to see in Sheffield city centre. 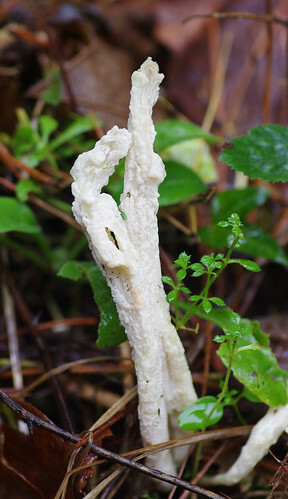 I first thought these might be White Spindles but the fungal bodies were thicker and more nobbly. 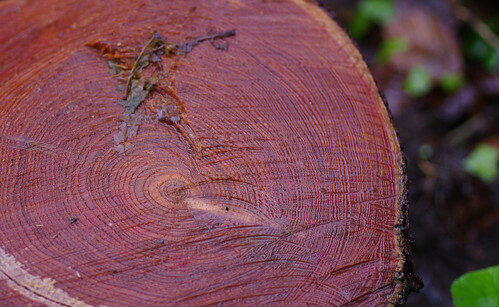 I think the above is a variation of a standard Beech Jellydisc. It will be interesting to return in a few months to see precisely what form it has taken. After leaving Hoodown behind, we walked along a lane and came to a woodpile. I have looked from cover to cover in my field guide and racked my brains over these mystery species until there is nothing left to rack. 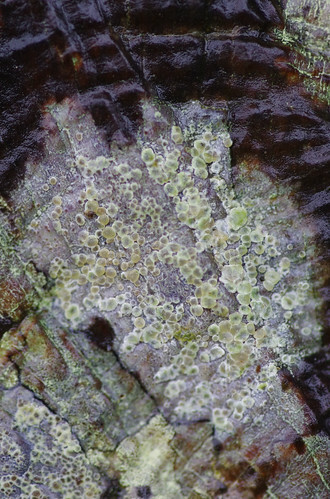 I could not tell if these are the natural colours of the lichens. 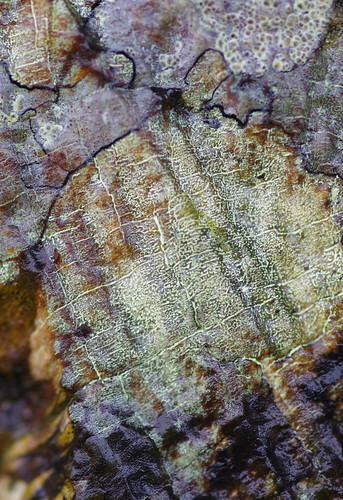 Perhaps the thallus (the main body) is under the surface of the wood. 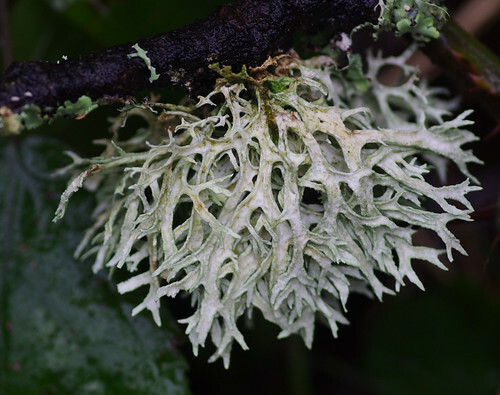 There is a clear black prothallus which is similar to the Rhizocarpon lichens (and no doubt many others) but beyond that I will have to admit defeat. The next picture shows greater detail from the top right corner of the first image. Discs are present in good numbers. Their shape, colour and frequency can sometimes narrow a search considerably. Not this time, alas. We have been seeing this species on a regular basis recently. 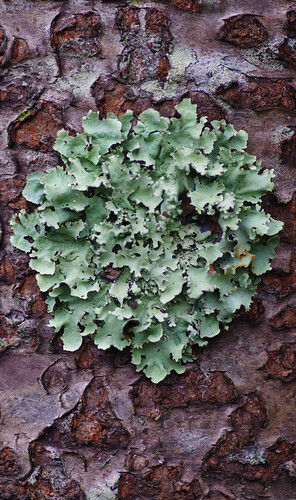 This one, on the trunk of a conifer, has to be the most impressive specimen so far. They go grey when dry but in wet conditions are a lovely leafy green. 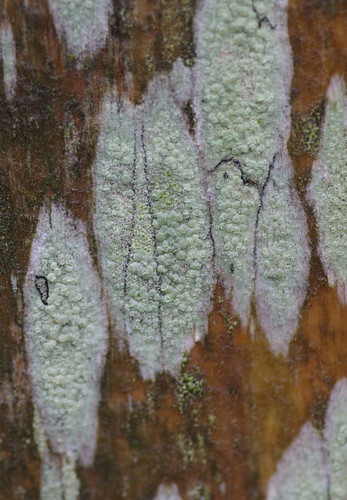 I may not know the species but I'm wondering if these lichens have artistic ambitions. They appear to mimicking a Rothko. Or perhaps the artist had an unknown and unusual source of inspiration. No doubts about this one. 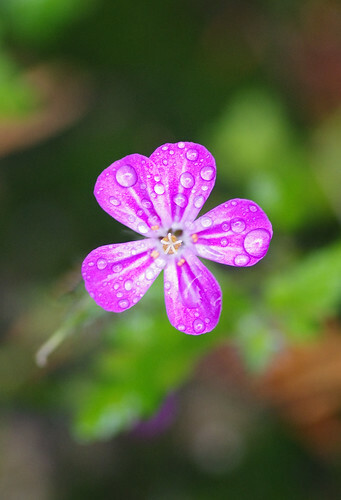 These flowers can be seen throughout the year in places. This year I will be looking out sharply for its close relation: the much less common Little-robin. 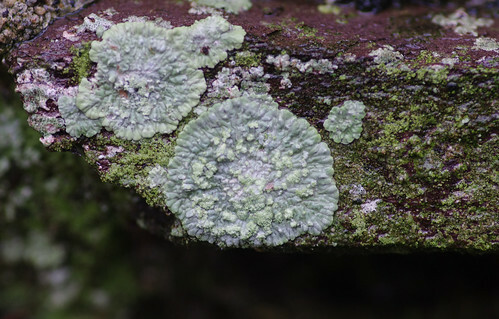 These lichens were growing on rocks. With their various characteristics I thought there was bound to be a match in the field guide. I have postponed my search for now but will resume it in the future. This one better resembles the samples I have seen. I think it must be an older specimen, judging from the branches and the slight discolouration at the roots. 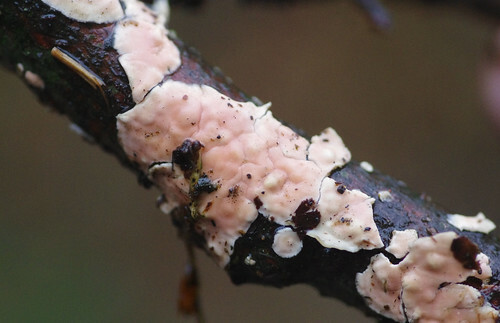 Some of the lower branches appear reddened. 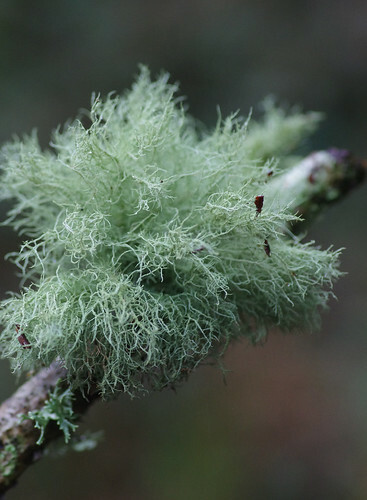 This is possibly the densest and bushiest Usnea we have seen. Under a hand lens it might provide the odd clue or two. The crust was smooth and a delicate pink. As yet we have been unable to find a direct match although I'm sure we have seen something like it on a few occasions. 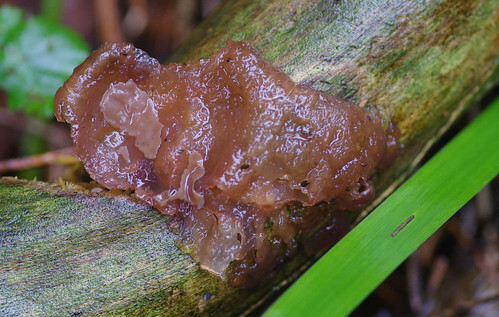 There is a species called Rose Crust and although none of the pictures and images I have looked at match this one, I'm hoping the words describe our specimen sufficiently accurately. This one was growing on a dead branch on the ground. I picked it up so that Sherry could take a better picture with more of a pleasing blur in the background. The buzzword in photographic circles is 'bokeh'. And that was all we had time (and the inclination) for. With our waterproof layers stuck to the skin we hastened to the end of our walk and a welcome change of clothes at home.